England claim their first series tournament win of the season as Australia finish third in Langford. England claimed their first series tournament of the season with a 31-14 win over New Zealand in Canada on Sunday. It was the first time this season that Australia didn't win a round, having claimed top prize in Dubai, Sao Paulo and Atlanta, as the girls in gold were beaten by England in the semi-final. However Tim Walsh's side can still claim the series at the next round in Clermont-Ferrand next month. Another thrilling women's sevens series final saw England and reigning champions New Zealand battle it out in beautiful conditions in British Columbia with a first half that contained no less than five tries and England lead 19-14 at the break. However, England's experience and fitness shone through in the end with HSBC Player of the Final Heather Fisher, as well as Jo Watmore and Alice Richardson, making the difference for the ladies that are likely to make up the bulk of Team GB at the Olympic Games in Rio this year. Sarah Goss started the scoring for New Zealand from close range early in the final, before Heather Fisher immediately struck back, showing her power from a distance. Both Portia Woodman and Alice Richardson showed their electric pace and it was Heather Fisher who had the final word of the first half - her try gaving England a five-point advantage at the break. The tempo rose again in the second half and England took the game by the scruff of its neck. Alice Richardson and Jo Watmore’s scores put the match out of New Zealand’s reach and England thoroughly deserved their first victory in the series since 2013. 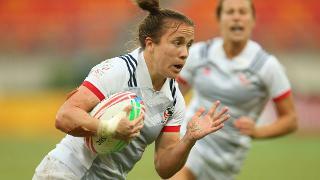 Speaking afterwards, captain Emily Scarratt said: "I'm thrilled with the performance. We knew that if we played the way we know we can, we could get to the final. "It was a really tough match against New Zealand but we stuck to the system. The first half was ping-pong in terms of tries but we stuck to our systems and we've our reward now. "We've now got a few days off when we get home, as we're absolutely shattered after a back-to-back set of tournaments. But it's a great feeling," said Scarratt. Winning coach Simon Middleton was proud of the effort shown by his players. "The girls were absolutely outstanding today, executed the game plan to a tee and played with loads of compusure and energy. Our defence was particularly good against Australia and New Zealand and i couldn't be more proud." The opening cup semi-final between Australia and England was played at an incredible pace and intensity. Locked at 5-5 at the break, England’s head coach Simon Middleton promised a ‘battle of wills’ and it turned out to be one that his side won. A storming second-half from Jo Watmore helped Middleton's side, as she set up one try and scored a second to book England’s place in the final. The second semi-final saw a French side who, contrary to recent performances on the circuit, play at a blistering pace that threatened to knock out New Zealand and put them into a cup final. Tied 7-7 at full-time, neither side could find the decisive points to take the game. But come extra-time, there was one lady that New Zealand were desperate to get the ball to, and when they did, Portia Woodman accelerated down the left-hand wing to deliver the golden points, after a French overthrown lineout. An England v New Zealand final awaited. The opening plate semi-final saw hosts Canada taking on Russia, while trying to shake off the disappoinment of losing a last-gasp quarter final loss to France in front of their raucous home fans. However the French defeat clearly spurred them on, blasting past Russia in the first semi. Spain beat USA, for the second time this weekend, to reach the Plate final, but with the home crowd in fine voice, Canada were too much for the European side. Ghislaine Landry started the scoring in the Plate Final by converting her own try and from there on, the hosts put on a show for the home supporters. The first bowl semi-final was a dramatic match between Ireland and Brazil, with Ireland scoring first and retaiing most of the possession. However Brazil grew into the game and despite a super human try-saving tackle from Lucy Mulhall to hold up Amanda Araujo, the final play of the game saw a try from Julia Sarda seal the victory. The second bowl semi-final saw Fijiana beat Japan despite going down to five players at one stage. The Fijians then beat the plucky Brazilians to claim the first silverware of the day with ease, with Rusila Nagasau turning heads with her skilful and physical nature during the match. Australia and Spain kick-started the day with the first cup quarter-final and it was a comfortable victory for Tim Walsh’s side. Nicole Beck and Emilee Cherry showed great experience and skill as Spain failed to get a point on the board. Next it was New Zealand’s turn to make a statement of intent. The Kiwis scored seven tries against Russia, with Katrina Whata-Simpkins notching up a hat-trick. After an unbeaten day one, the runners-up in Atlanta looked like they meant business, even at that early stage on day two. In front of their home crowd Canada suffered heartbreak in their cup quarter-final. Early on in the match they were well in control but as the game went on France found their stride. Jade Le Pesq scored the try to level the game and Shannon Izar showed nerves of steel to nail the touchline conversion and book Les Bleues' place in the cup semi-final. The final cup quarter-final saw England start strongly against USA and although the Americans bounced back before half-time, Joanne Watmore and Danielle Waterman led the way for England as they marched into the cup semi-final.